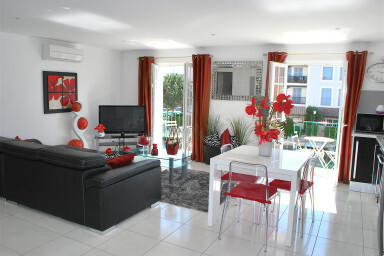 Large 4-room apartment (about 91 sqm) entirely renovated in the center of Port Grimaud 1. The apartment is composed of a wide and clear living-room with a modern open-plan kitchen open onto a nice balcony overlooking the canals, 3 bedrooms among which two spacious ones, 2 shower-rooms, separate toilets and a laundry. A West-oriented balcony all along the living-room. Beautiful view on the canal. The beach and the facilities are near-by. Possibility of mooring with the apartment.